Once upon a time, in England, "there lived a king who had three daughters; the two eldest were proud and ugly, but the youngest was the gentlest and most beautiful creature ever seen, and the pride not only of her father and mother, but of all in the land." Now as girls will, these three often opined of what would make the best husband. "I will have no one lower than a king." said the first. 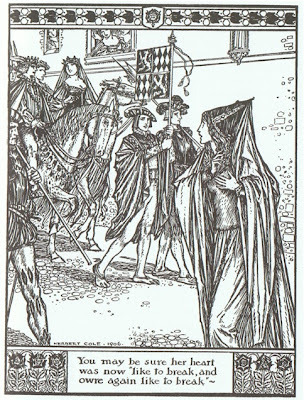 The second that she would accept "a prince or a great duke even". "Pho, pho!' said the youngest laughing. 'You are both so proud; now, I will be content with the Black Bull o' Norroway." With that, the three drifted off to sleep. But first thing in the morning, they heard "the most dreadful bellowing at the door, and what should it be but the Black Bull o' Norroway come for his bride." He was "the most horrible creature ever seen in the world" and the king and queen were most certainly not going to put their daughter upon his back. So they tricked the "old henwife" into getting on instead and "away he went with her till he came to a great black forest, when, throwing her down, he returned, roaring louder and more frightfully than ever." So they put the kitchen maid on his back, and off he trotted. Soon he was back, angrier than ever. Now the royal couple tried to falsify the bargain by sending, "one by one, all the servants, then the two eldest princesses; but not one of them met with any better treatment that the old henwife." So, finally, she who had spoken so carelessly of marriage with the Black Bull consented to keep her word. She bid her family farewell, and climbed upon the great creature's back. They rode far, passing through forests so dark the sunlight never shone there, and across plains so barren that no animal lived there. At last, they came to a fine castle. "The lord of the castle pressed them to stay, though much he wondered at the lovely princess, and her strange companion." As the princess and the bull passed through the castle gates, she happened to look at a particular spot on the bull's neck. There she "espied a pin sticking in the Black Bull's hide, which she pulled out, and, to the surprise of all, there appeared not a frightful wild beast, but one of the most beautiful princes ever beheld." And now the princess was free to rejoice over her betrothed, and the two announced their wedding, and all in the castle received the news with great joy. That's when "he suddenly disappeared, and though every place was sought, he was nowhere to be found." The princess' heart, which had been bursting with happiness, now sank low from sorrow. She departed from that palace, vowing to find her lover wherever he might be. She strode through valleys and over mountains, and through woods so dense that she had to cut her way through. At length, she knew that her body would fail her, and she must soon lay down to die. Just then, she saw "a light through the trees. She went on till she came to a little hut, where an old woman lived, who took her in, and gave her both food and shelter." When morning came, this one gave her "three nuts, that she was not to break till her heart was 'like to break and owre again like to break'. " The princess thanked her and took her leave. As she walked down the road she was overtaken first by one merry party, and then another. Asking one of these riders whither they travelled, she learned that they were on their way to "the Duke o' Norroway's wedding." So the princess followed in their path, and so she soon came to a fine palace where "where nothing was to be seen but cooks and bakers , some running one way, and some another, all so busy that they did not know what to do first." Then, along came a crier, and a trumpeter, and a troop of soldiers calling "Make way for the Duke o' Norroway". And there before her eyes passed "the prince, and a beautiful lady. You may be sure her heart was like to break and owre again like to break at this sad sight, so she broke one of the nuts, and out came a wee wifie carding wool." 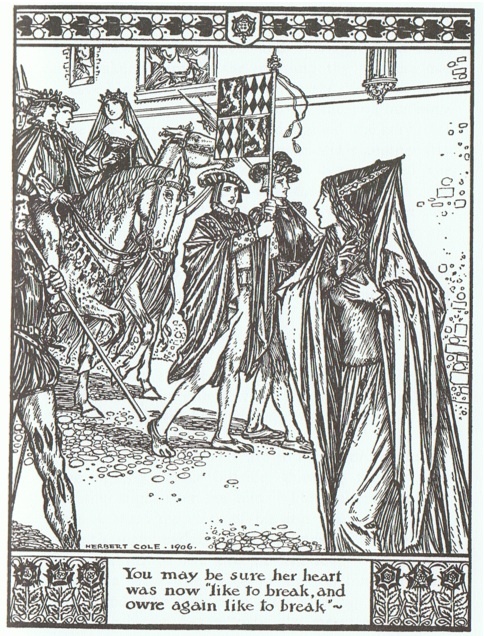 Now the princess entered the palace, and when the Duke o' Norroway's bride to be saw "the wee wife so hard at work" she begged to buy her from the princess. She offered any price that the other could name. The price named by the princess was a delay in the marriage for one day, and the privilege of sitting in the duke's bedchamber for one night. This was agreed to, and "when dark night was come, and the duke fast asleep, the princess was put alone into his chamber. Sitting down by his bedside, she began singing, 'Far hae I sought ye, near I am brought to ye,Dear Duke o' Norroway, will ye no turn and speak to me?" But the duke never heard her. In the morning, the princess broke the second nut. Out came "a wee wifie spinning, which so delighted the lady that she readily agreed" to put off the wedding another day and a night. But again the duke slept soundly, and never heard the princess singing." So in the morning, she broke the third nut. What should it contain but "a wee wifie reeling". If only the lady could have this little wifie as well, she would be able to have half the work of weaving done. The first wee one prepared the wool, the second spun it into thread, and this third would wind it upon the bobbin. The same deal as before was struck, and the princess prepared to spend one final night with the duke. On this same morning, the duke's manservant complained to his master that for the last two nights he had been unable to sleep for the weeping and singing coming from the duke's chamber. The duke was outraged: of what weeping did the man speak? So the manservant convinced his master to lay awake, though feigning sleep that night, and hear what he could hear. That night, in the darkest hour, the princess was again admitted to the chamber. As soon as she commenced singing, the duke leapt out of bed in joy. He "greeted her with many endearing expressions of surprise and joy. " Then he told her that he "had long been in the power of a witch-wife, whose spells over him were now happily ended by their once-again meeting." They were married first thing next day, "and so ended the adventures of the Black Bull o' Norroway and the king's daughter." Notes: Here we find the breaking of a spell by the removal a pin from the hide. This is close magic to the casting of a spell by pricking the skin or scalp, as when Snow White puts a poisoned comb into her hair and it pierces her head. 1. Read this story and write down the royal people and their titles. (king, queen, princesses, prince, duke).